Unquestionably, you'll want to make a logo for your site. That's almost a guarantee. If you don't have a logo yet, you'll want to get one. We recommend the use of the service CoolText for quickly creating a logo for free. This is a good service for generating a placeholder logo until you get a custom logo made. Making a custom logo isn't as difficult as it might sound. You can make a logo taking advantage of the WoW Model Viewer program (if you are a WoW Guild), or taking a screenshot in-game of you and your guild mates, and modifying it even with MS Paint. If you need something more advanced for cheap you can get GIMP, which is a free image manipulation program. This works pretty well, as is considered by some to be as powerful as Photoshop. Which brings us to commercial programs for doing logos. The most popular, and also most expensive option is Adobe Photoshop. If you are a student, then you can get a significant discount from certain vendors (sometimes even from university bookstores). Another major commercial product, which is cheaper (but which I find to be more friendly to noobs like myself) is Corel Paint Shop Pro. It is much cheaper than Photoshop, and powerful enough for simple image tricks. This sells for about $100 retail, and cheaper if you buy an older version. The graphics for the DKPSystem.com homepage were done in this program, so it's no chump. And click on "Logo and Top-Bar"
Find your logo on your hard drive by clicking the "Browse" button, and then at the bottom click "Submit". Also on this page, you can modify the top-bar format, or eliminate it altogether. The images here are pretty straightforward descriptions of what the Top Bar formatting does. If you happen to upload an image that's very large, this page will tell you. If you check the box labeled "Resize it to try and make it fit? ", and then click "Submit" again, the page will resize the image to a size that it thinks is a good size. Sometimes, you'll want to use a background image on your site. It can add a bit of flair. Doing this is rather simple. Head to the Admin menu and click "Background Image"
Click "Browse" to find your image you wish to make your background, and click "Submit." Bullet Images are the images that appear next to list items. The cmost common place for these is next to items on the menus. To change your bullet image, simply head to the Admin menu, and click on "Bullet Image"
This page works much like the Background page. Upload the file and it'll take effect. You want to make sure you don't upload a massive image for your bullet image. If you do, you face the possibility of making your site unnavigable. Try to keep the images around 16x16 pixels, or only slightly larger. Even though you could upload an image that's 50x50, your site will look rather silly, and be a big unprofessional turnoff to your members. Keeping the image smaller keeps it looking correct and more professional. [b]Logos[/b] Unquestionably, you'll want to make a logo for your site. That's almost a guarantee. If you don't have a logo yet, you'll want to get one. We recommend the use of the service [url=http://www.cooltext.com]CoolText[/url] for quickly creating a logo for free. This is a good service for generating a placeholder logo until you get a custom logo made. Making a custom logo isn't as difficult as it might sound. 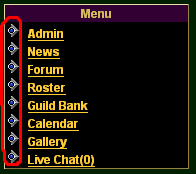 You can make a logo taking advantage of the [url=http://www.wowmodelviewer.org/]WoW Model Viewer[/url] program (if you are a WoW Guild), or taking a screenshot in-game of you and your guild mates, and modifying it even with MS Paint. If you need something more advanced for cheap you can get [url=http://www.gimp.org/]GIMP[/url], which is a free image manipulation program. This works pretty well, as is considered by some to be as powerful as Photoshop. Which brings us to commercial programs for doing logos. The most popular, and also most expensive option is [url=http://www.adobe.com/products/photoshop/index.html]Adobe Photoshop[/url]. If you are a student, then you can get a significant discount from certain vendors (sometimes even from university bookstores). Another major commercial product, which is cheaper (but which I find to be more friendly to noobs like myself) is [url=http://www.corel.com/servlet/Satellite/us/en/Product/1184951547051]Corel Paint Shop Pro[/url]. It is much cheaper than Photoshop, and powerful enough for simple image tricks. This sells for about $100 retail, and cheaper if you buy an older version. The graphics for the DKPSystem.com homepage were done in this program, so it's no chump. In any case, after you've got your logo, you'll want to put it on your site. The method of doing this is to head to the Admin Menu [img]faq/adminmenu.png[/img] And click on "Logo and Top-Bar" [img]faq/logoandtopbar.png[/img] Find your logo on your hard drive by clicking the "Browse" button, and then at the bottom click "Submit". Also on this page, you can modify the top-bar format, or eliminate it altogether. The images here are pretty straightforward descriptions of what the Top Bar formatting does. If you happen to upload an image that's very large, this page will tell you. [img]faq/logotoobig.png[/img] If you check the box labeled "Resize it to try and make it fit? ", and then click "Submit" again, the page will resize the image to a size that it thinks is a good size. [b]Backgrounds[/b] Sometimes, you'll want to use a background image on your site. It can add a bit of flair. Doing this is rather simple. 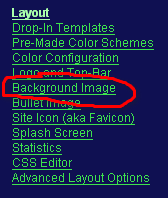 Head to the Admin menu and click "Background Image" [img]faq/backgroundimage.png[/img] Click "Browse" to find your image you wish to make your background, and click "Submit." If you wish for the background image to tile (repeat), check the box for Repeat Background Image [img]faq/repeatbackgroundimage.png[/img] [b]Bullet Images[/b] Bullet Images are the images that appear next to list items. The cmost common place for these is next to items on the menus. 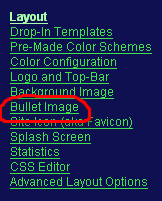 The circled sections are the bullet images [img]faq/bulletimages.png[/img] To change your bullet image, simply head to the Admin menu, and click on "Bullet Image" [img]faq/bulletimage.png[/img] This page works much like the Background page. Upload the file and it'll take effect. [#ff3f1f]You want to make sure you don't upload a massive image for your bullet image. [/#ff3f1f] If you do, you face the possibility of making your site unnavigable. Try to keep the images around 16x16 pixels, or only slightly larger. Even though you could upload an image that's 50x50, your site will look rather silly, and be a big unprofessional turnoff to your members. Keeping the image smaller keeps it looking correct and more professional.